A research team led by Professor Kezhong Zhang, Ph.D., at the Wayne State University School of Medicine's Center for Molecular Medicine and Genetics and the Department of Biochemistry, Microbiology and Immunology has made a key discovery in a stress-induced small RNA decay pathway in non-alcoholic fatty liver disease that could significantly impact the understanding, prevention and treatment of cardiovascular and metabolic diseases. Non-alcoholic fatty liver disease, or NAFLD - closely associated with human obesity, type-2 diabetes and atherosclerosis - is the buildup of extra fat in liver cells, not caused by alcohol. Chronic stress conditions, such as high-fat diets, air pollution and irregular circadian rhythm related to shift workers and continental travels, are major causes of NAFLD, Dr. Zhang said. About 100 million people in the United States are estimated to have this type of liver disease, or 30 to 40 percent of the population, per the National Institute of Diabetes and Digestive and Kidney Diseases. Globally, NAFLD affects 15 percent to 40 percent of the general population, he added, and is intrinsically linked to metabolic disorders such as obesity, type-2 diabetes, atherosclerosis and liver cancer. "However, currently no effective medicine to treat patients with NAFLD is available. There are knowledge gaps in understanding the molecular basis by which chronic stress causes lipid buildup in the liver. There is a critical need to identify molecular mechanisms driving NAFLD under chronic stress conditions," he said. Dr. Zhang and colleagues discovered a novel stress-triggered small RNA (or microRNA) degradation pathway in the liver, and revealed how this stress signal pathway is critically involved in the progression of NAFLD under the high-fat diet. The related discoveries were published in the top-tier journal Science Signaling at http://stke.sciencemag.org/content/11/530/eaao4617. "Our findings have direct impact on understanding the fundamental process by which cell stress modulates microRNA profile and subsequent gene expression landscape associated with metabolic disease," Dr. Zhang said. "The newly-identified stress-triggered microRNA decay pathway will have profound impact on many areas of biomedical research." Dr. Zhang, the senior corresponding author of the research article, has long studied mechanisms and impact of stress responses in health and disease. His team also revealed that high-fat diets can repress the cell stress sensor protein IRE1α, which functions as an enzyme called RNase to cut stress-inducible microRNAs. The select microRNAs, once cleaved by IRE1α, will be degraded before going through the regular biosynthesis and maturation process. The new pathway, named "IRE1α-dependent microRNA decay," decreased the abundance of lipid metabolism enzymes, leading to lipid buildup in the liver. The scientists showed that IRE1α-dependent microRNA decay pathway was impaired in the livers of both high-fat-fed mice and human NAFLD patients. The cell stress sensor IRE1α regulates a subset of microRNA families that are functionally involved in lipid metabolism and inflammation in the liver. The regulatory signals originated from IRE1α are further amplified with a spectrum of the microRNA targets. These findings reveal a novel target -- IRE1α -- to explore for treating nonalcoholic steatohepatitis, a type of NAFLD, and associated metabolic disorders. "One stress sensor protein (IRE1α) dictates a network of lipid metabolism enzymes through modulating microRNAs in the liver. Therefore, IRE1α represents an ideal target for controlling lipid metabolism associated with the development of metabolic disease, such as obesity, type-2 diabetes and fatty liver disease." Dr. Zhang said. "Indeed, we have been working on several non-toxic small molecules that can either suppress or activate IRE1α in the liver. Our work provides an effective avenue to modulating lipid metabolism for therapeutic benefit for NAFLD." 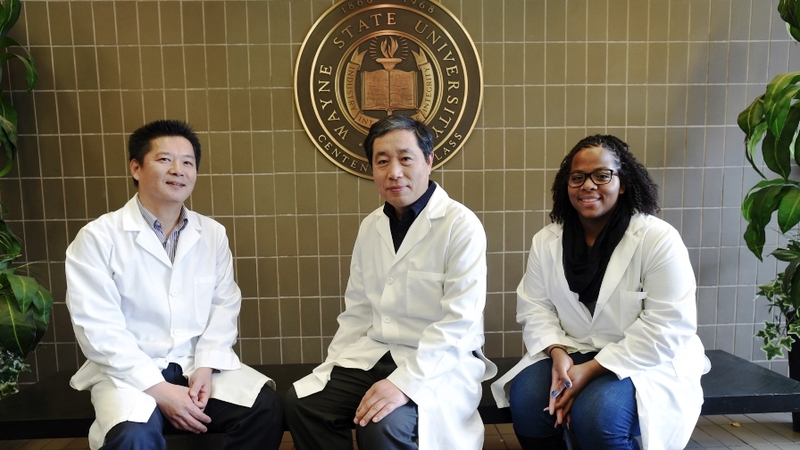 Wayne State University researchers Jiemei Wang, Yining Qiu, Zhao Yang, Hyunbae Kim and Chunbin Zhang contributed to the work. Other collaborators included scientists from University of Iowa, Sanford Burnham Prebys Discovery Institute of San Diego, University of Ulsan of Korea, Northwestern University, University of Michigan and The Ohio State University. The work was partially funded by NIH's National Institute of Diabetes and Digestive and Kidney Diseases (grant No. DK090313), National Institute of Arthritis and Musculoskeletal and Skin Diseases (grant No. AR066634), National Environmental Health Science Institute (grant No. ES017829) and American Heart Association Grants (grant Nos. 0635423Z, 13SDG16930098, 09GRNT2280479).